Led by the executive director of the fund, a group of Hayastan representatives has been in NKR these days to discuss relevant plans. 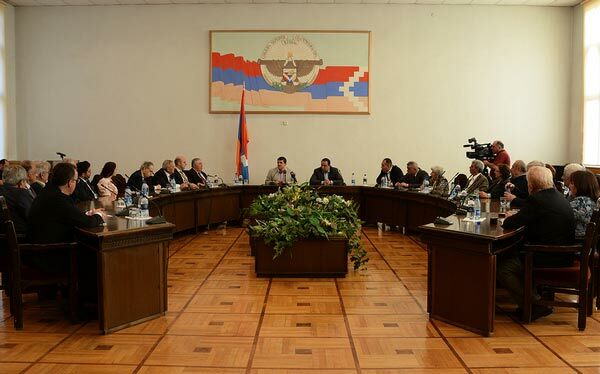 On Sunday, NKR Prime Minister Arayik Harutyunyan received the Hayastan Fund delegation, thanking them for their continued support. “Educated and patriotic citizens and soldiers are the basis of the strength of the Army. The programs of the Fund carried out in almost all districts of the republic and focused on kindergartens and school reconstruction, improvement of water supply and roads have contributed to the prevention of the outflow of the population, improvement of the demographic situation and to having a generation of healthy and educated patriots,” the NKR premier said. The Hayastan Fund’s Executive Director Ara Vardanyan, on behalf of the Fund’s representatives, expressed readiness to always support Nagorno Karabakh and carry out projects for its benefit. Last week, Vardanyan said that at the meeting of the Fund’s Board of Trustees and local bodies they would discuss the issue of using the bulk of the raised money for the elimination of consequences of the April 2-5 war in Karabakh. “I cannot even say approximately how much money should be provided, but the support should be versatile, ranging from drug delivery, to aid to separate families, including families of deceased soldiers,” he said. 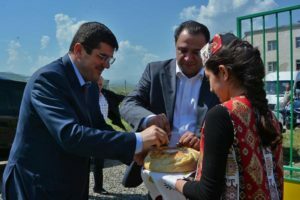 Within the framework of the visit to NKR, the director and representatives of the Hayastan All-Armenian Fund also attended a ceremonial opening of a kindergarten in the Askeran district of Karabakh. The kindergarten was built with co-financing of the Fund’s Toronto affiliate and the NKR government. Prime Minister Harutyunyan appreciated the Diaspora assistance to the construction. “Dear brothers and sisters in the Diaspora! We always highly appreciate your contribution in Artsakh [an alternative name for Karabakh]. Today, thanks to your caring attitude, together with you, we celebrate another festival because the opening of an educational establishment in Artsakh is always considered a festival. Moreover, with such projects we also honor the bright memory of our fallen heroes, because the boys gave their lives for the continued existence and development of their Motherland,” he said in his remarks at the kindergarten opening ceremony. The Hayastan Fund, which was established by a presidential decree in 1992, has so far carried out a fairly large amount of charity work in NKR, eliminating the consequences of the 1990s war. Along with the construction of roads, schools, kindergartens, hospitals, water and gas networks the Fund has provided assistance to Karabakh’s socially vulnerable groups, including families of soldiers, students from poor families and others.